DDIII is now running the riser pipe down. They have 67 joints to complete, they've done 39 of those as of about 10:30 Central Daylight time this morning, need about five more hours to do that. They are planning to latch on to the well around midnight tonight. Development Driller II which was – had drill – was involved in drilling the backup well is returning to site and will start running their riser today. Q4000 is inspecting the yellow pad, that is the control device that's placed subsea to operate the hydraulics. They replaced the valve on that and they plan to install it later on today and then they will begin preparations for the static kill operations. He also noted that the pressure in the well has now risen to just over 6,900 psi, while the temperature at the BOP remains at 40 deg – suggesting no flow and that well integrity is apparent. The storm has, however, dispersed and moved the oil, and they are resurveying to find where the threats now lie. He then gave the current anticipated time line for the kill of the well. The time line is roughly over the next week. We'll return the Development Driller III, run the riser pipe, latch in, pull that undersea containment device, which they call a packer. They're going to need to circulate conditioning fluids through that pipe line to make sure it's ready what they call conditioning a hole and then some time in the next week they'll be in a position to be able to run that (nine and seven-eighths inch) liner which is the critical path right now to moving – to move ahead. Once that liner is laid, they're going to put cement in and around it. And at that point the two vessels that were supporting the liner operation, one call the Blue Dolphin, the other is called the Center Line will redeploy and hook up with the Q4000. This is sometime – this will be sometime during the week of 1 August. And they will set up for that to be able to inject the static kill and during that week of August subject to the (inaudible) I'm sorry the containment pipe being installed and cemented in then we will go to the static kill with the Q4000. 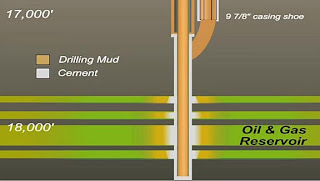 Kent Wells has also now released the animation showing how the different kill methods will take place, and interestingly also showed the section at the bottom of the well that shows the different layers of oil bearing rock in the reservoir. The animation follows along the process in much the way that I described in an earlier post on the bottom kill, which is now scheduled in two parts. As the Admiral noted, the first part is to case the relief well. Once that is in place, and the cement run, then the top kill will start. Because the well is shut-in, the plan is that the flow to the surface will be reversed. the flow lines are now passing oil and gas to the surface, the circuits will be reversed to return them to their original condition, and then mud will be fed into the well. Because this can be done a little at a time, it will be, and the pressures will be monitored to ensure that, as the well fills with mud, that there are no integrity problems. Once the well is full of mud, they may try pumping cement into the well from the top (this is shown in the animation), though, because of concerns over flow control, I would suspect that they will not put the cement in until they connect through the relief well, and they will then do a two stage (annulus and then inside the casing) final kill. And I should note that, contrary to my concern, the leaks that are being shown again now by the HOV ROV1 are no worse than they were before the storm, so perhaps that is not going to be much of a problem going forward.